Minigolfnews - Welcome Chromax Golf to Minigolfnews! Welcome Chromax Golf to Minigolfnews! The Chromax� Golf Company has a team passionate about golf. We see how excited players are when they see the reflective colors of our golf balls and they find the colors that improve their own game. We are a small golf ball company with BIG colors. Chromax� high visibility, combined with a soft feel from our proprietary core and coating, make the game easier to see and more fun to play. 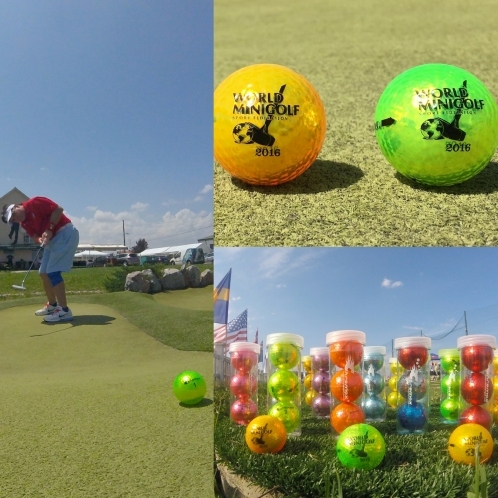 We are the perfect ball to bring more folks to the game of Putt-Putt, Miniature Golf and Regulation Golf, with our quality and extraordinary colors. The Chromax� patented coating process, was invented by our co-owner, Stuart Lin. Stuart is a physicist, materials engineer and a scratch golfer, with over 30 years of experience manufacturing high quality golf balls. Using his extensive knowledge and expertise, his goal was to make a new, tournament approved, high visibility golf ball. The feel, play, durability and easier tracking of Chromax� golf balls unique coating, core and dimple design are a combination that works and grows our loyal player base every year. Our ball specs are found on our website. After extensive development and testing we were the first reflective colored golf ball on the U.S.G.A. and R&A Conforming golf ball list. In 2014, we discovered an extraordinary professional putter and recreational golfer, Matt Bellner. (For those of you who have met Matt, you know he loves the sport and community of the �Putting� world. You can find Matt on Twitter.) Until that time, Chromax� employees had all played mini-golf before, but Matt brought a fresh new perspective to the growing sport of competitive putting. We were honored to be the sponsor for, the USA team at the World Minigolf Sport Federation (WMF) World Adventure Golf Masters in Kosovo 2016, followed by the 2016 United States ProMiniGolf Association (USPMGA) Masters and the upcoming 2017 USPMGA Open and Masters. Chromax� Golf is appreciative of the support from the Professional and recreational putting community and thanks all of you who have found the Chromax� color that reflects your game. Chromax� Golf balls are available worldwide in pro shops, retail stores and on our website in the U.S.A. Chromax� has distributors for international sales in Australia, Canada, Germany, Switzerland and the United Kingdom and these can be found on our distributors list. For more information please visit www.chromaxgolf.com or call (303) 219-0868. Editor's Note: We are happy to welcome Chromax on-board as Minigolfnews.com sponsor for 2017 and provided this introductory article as part of that partnership. You can read a little more about Chromax at the WAGM in our interview with Team U.S.A..
New year but the same old League - Finnish Winter League continued!